There’s been so many recent updates in Disney World we thought we’d write up a quick post to let you all know about the exciting changes and new openings in Disney World. Tiffins is a brand new Signature Restaurant that recently opened in Disney’s Animal Kingdom. Since Tiffins is a signature restaurant the pricing is pretty steep here. Tiffins offers a vegan item on the menu, Roasted Market Vegetable Curry, which features a Lime Chutney and Spring Vegetables. You can get this dish at the price of $29. Next to Tiffins is a new bar called Nomad Lounge. Here you can find signature drinks, both alcoholic and non-alcoholic. Additionally there is a Vegetarian Summer Roll here that is vegan. There have been a bunch of new openings at Disney Springs recently. One of the new openings is a kiosk called B.B. Wolf’s Sausage Co. which features a vegan Field Roast sausage. You will need to ask for a pretzel bun as the regular bun has yet to be confirmed that it is vegan full time. You can always ask to check the allergy binder here. 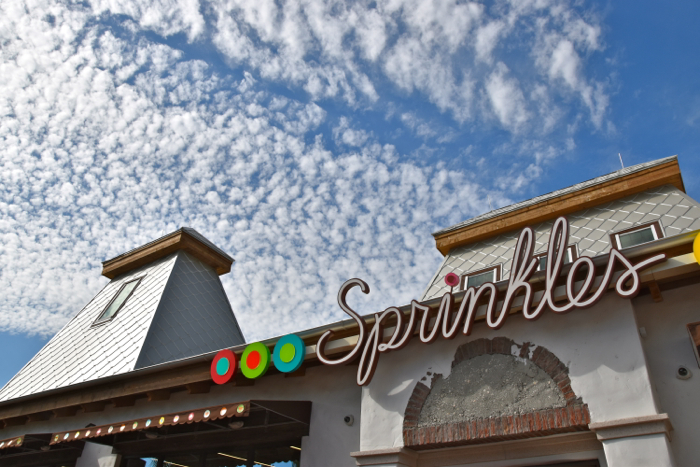 Another opening in Disney Springs is Sprinkle’s Cupcakes. Sprinkles is a cupcake chain that has been around for years. They offer a single vegan option, the red velvet cupcake. Epcot’s Soarin’ over California is no more! Recently the new film, Soarin’ Around the World, features highlights around the world opened in replace of Soarin’ over California. This film hits new spots like the Taj Mahal, Paris and the Pyramids of Giza. Now that Soarin’ is reopened, Sunshine Seasons, which is located next to Soarin’, is now offering breakfast again. It doesn’t seem like they are too accommodating, as you can see from Cheryl’s picture above, but for a quick light option after an early Fastpass+ it isn’t too bad. Frozen Ever After has finally opened in Epcot. This ride has replaced the once loved Maelstrom in the Norway Pavilion. Because of the popularity of this ride, a portion of World Showcase is now open before 11. The Mexico pavilion is now offering breakfast, sorry no vegan options here, but we’re hoping this trend will offer a few other breakfast options in Epcot. It’s the time of year where restaurants are constantly updating their menus. We’re trying our hardest to keep these up to date right now, if you go somewhere and experience something different than what we have listed, please let us know! is so grateful for your help! Can’t wait for vegan Tongo Toast & so much more!